Nvidia's ShadowPlay is a great way to record your gameplay or broadcast it live to the world if you're running a GeForce graphics card. 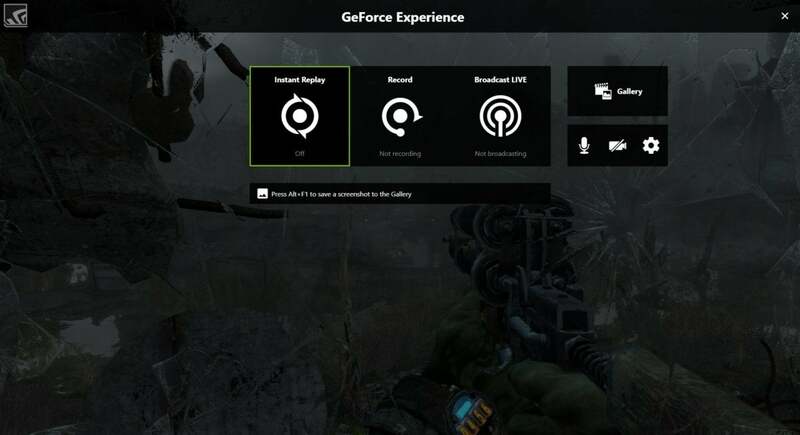 Nvidia’s GeForce Experience (GFE) software for PCs equipped with GeForce graphics cards looks straightforward enough as a tool for optimizing your game library and downloading the latest GeForce drivers. But underneath that primary utility are a few nice, yet not-so-obvious features, including a highly regarded game recording application called ShadowPlay. What new users may find confusing, however, is that the words ShadowPlay never appear inside GeForce Experience itself. Nevertheless, we’ll still use the term as long as Nvidia keeps using it. Instant Replay (when activated) continually records the last five minutes of your gameplay in a temporary location. To save any cool moves for posterity, press Alt + F10 and the last five minutes are automatically saved to your Videos folder in Windows. Instant Replay is a fantastic tool if you don’t want to record your entire gaming session but would still like to save a cool move or some ridiculous bug should it come up. If five minutes isn’t enough, Instant Replay can be set to store your last 20 minutes of gameplay up to 1440p resolution at 60 frames-per-second. The Record feature is a way to manually record your gameplay. To activate it hit Alt + F9, and then deactivate it with the same keystroke. This tool is great if you want to record a specific in-game event or stage such as a Survival session in The Division. Broadcast Live, meanwhile, is a way to stream your gameplay live to the world. ShadowPlay’s broadcasting works with Facebook, YouTube, and Twitch. It can stream up to 720p resolution at 30 frames per second on Facebook, 1080p/60fps on Twitch, and 1440p/60fps on YouTube. Each recording feature has settings to tweak video quality, recording length, bitrate, and frame rate. To tweak the settings for Instant Replay, you’d hit the Share button, select the Instant Replay tile, and then select the Settings option that appears below it. This is the same for Record and Broadcast Live, though Record has the same settings window as Instant Replay. There are also general settings for tweaking your audio and webcam video capture for broadcasting, and customizing the placement of framerate counters and other items for the in-game heads-up display. If you ask me the ShadowPlay interface (Share UI) looks a little strange. Nvidia created it as an overlay to make it accessible in-game, but when you’re outside of a game, setting things up on your PC feels very odd. There’s also a newer feature called ShadowPlay Highlights that doesn’t have its own tile, because there’s not much to tweak. Highlights automatically records your best gaming highlights in select games, similar to a feature in Plays.tv’s Plays desktop app. If you go into the general settings in the Share UI you’ll see a Highlights section where you can turn the feature on or off, specify the location where the PC temporarily saves highlights, and the maximum disk space the clips can take up. Current games that use highlights include Call of Duty: WWII, Fortnite: Battle Royale, PUBG, and Tekken 7. Nvidia has a complete list of Highlights-compatible games on its website. Using our standard test on a low-end gaming rig we found that running ShadowPlay had mixed results. Running three passes of the Metro: Last Light Redux benchmark on our low-end test rig on we saw an average framerate of 57.67. With the ShadowPlay Record feature active the average framerate dropped to 52.33. Turning to The Division the drop was much bigger. Without ShadowPlay, the budget rig scored an average of 56.3 fps, but once ShadowPlay was recording, that number dropped significantly to 43.9 fps. That’s still better performance than you'll see on consoles, but it’s quite a hit. Nvidia's ShadowPlay is a solid and easy to use feature that offers fairly good performance for low- to mid-range PCs. The nice thing about ShadowPlay is that anyone with an Nvidia card likely already has the software running on their machine. If you plan on using an alternative to ShadowPlay on a budget rig we’d recommend deleting the software to prevent GFE from running in the background, and dragging performance down even further. This story, "Nvidia ShadowPlay review: The best gameplay recording option for GeForce graphics card owners " was originally published by PCWorld. Nvidia's ShadowPlay can have up and down performance depending on your PC configuration. But it's free, easy to use, and can be tweaked for straight-up recording, grabbing the last few action-packed minutes of your game, or broadcasting your adventures on Twitch. ShadowPlay is part of Nvidia's GeForce Experience software and is only available to users rocking an Nvidia graphics card.